CHILDREN'S & YOUNG ADULTS. 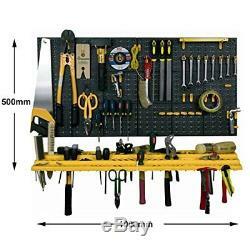 Garage Tool Rack Kits Wall Mounted DIY Tool Organizer Including Hooks BiGDUG (Tool Rack Kit). 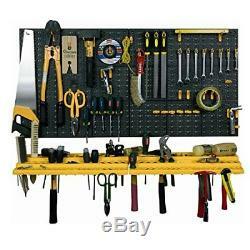 BiGDUG Tool Rack Kit With 50 Assorted Hooks Tough plastic construction. Holes for wall fixing (fixings not included) Dimensions: 1000w x 500d mm Comprises of 2 pegwall panels, a tool shelf & 50 assorted tool hooks Packs of 25 extra Hooks available on listing ID: B00OISK79Y Brand: BiGDUG Model: Does Not Apply EAN: 5060469968407 UPC: Does Not Apply Type: Kitchen & Home Dimensions and weights shown may refer to the item's packaging, not to the item itself. We reserve the right to cancel any orders were it is subsequently found that posting the item would breach local postal restrictions or laws. This helps us keep our ratings high and ultimately our prices low. We do not offer collection on any of our items as no stock is held at our registered company address. We take every care when listing our items to ensure that any stock images or catalouge content used does not infringe VeRO or Intellectual Property (IP) rights. And we will remove this immediatley. Please include your brand name and the Item ID of the listing you are querying. The item "Garage Tool Rack Kits Wall Mounted DIY Tool Organizer Including Hooks" is in sale since Monday, July 9, 2018. This item is in the category "Home, Furniture & DIY\DIY Tools & Workshop Equipment\Tool Boxes & Storage\Other Tool Storage". The seller is "barracauk" and is located in London. This item can be shipped to United Kingdom.